Jon Stanley, born in 1988, has always had a fascination with electronics and how things work. His first electrical circuit with a battery and a light bulb was made at an early age. This fascination was evident in the books he read on science, electronics, and the evolution of technologies that preceded today’s modern technologies. At eleven, Jon was given a pair of 12AU7 vacuum tubes by a friend of his parents, sparking an interest in anything with vacuum tubes. Curiosity about vacuum tubes eventually led to his discovery of vintage radios and an interest in how they worked. This fascination with vintage electronics grew to include old televisions, computers, and more. Jon joined the Vintage Radio and Phonograph Society (VRPS) in 1999. Members helped Jon repair old radios and introduced him to vanishing older technologies and their evolution to today's electronics. In 2006 Jon graduated from Denton High School in Denton, Texas. During his high school years, Jon was an active member of the Technology Club and he created many electronic projects and most are presented in the projects page. Many projects received first place honors at the Texas Technology Students Association (TSA) competitions. 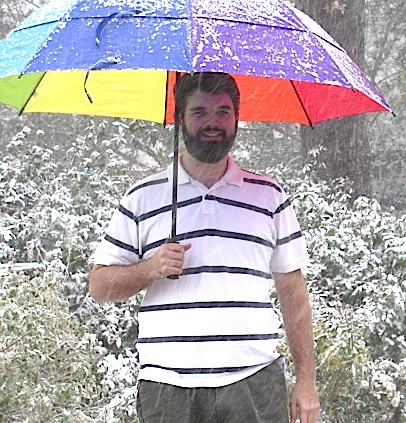 Jon attended Rice University in Houston, TX from 2006 to 2010 and graduated with a BSEE degree. After graduation, he started working as an electrical engineer at National Instruments in Austin, TX. During the first 5 years at National Instruments, Jon attended the University of Texas at Austin as a part-time student and graduated with a MSEE degree in 2015 with a concentration in Integrated Circuits and Systems. More professional information can be found at Jon's Linkedin profile. 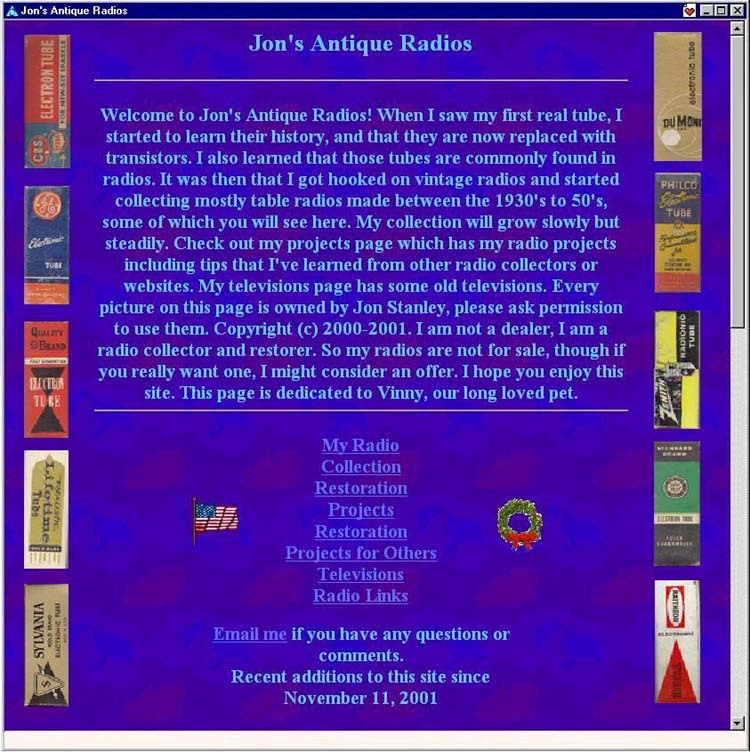 This website originally began in late 1999 as "Jon's Antique Radios" to exhibit Jon's small collection of vintage radios. 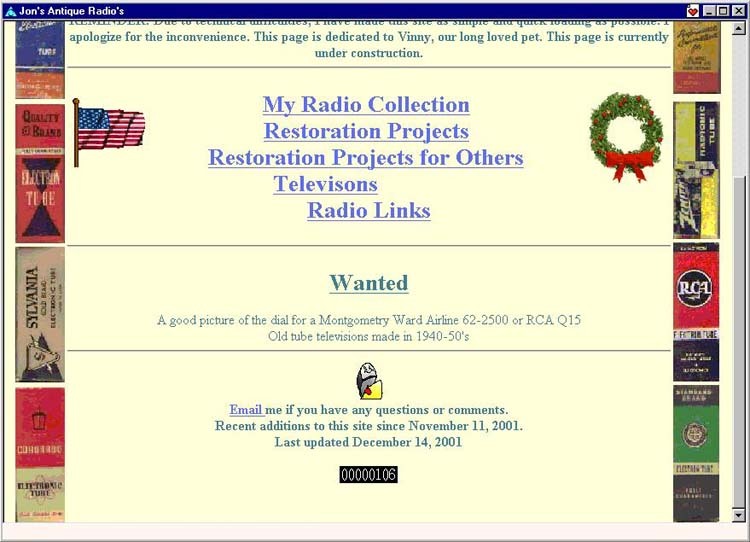 The website has grown over the years as more and more radios, televisions and other miscellaneous items were added to the collection. AOL provided a website generating software that was originally used to create the website. Eventually the website began to appear inflexible to screen resolutions, text sizes, and download times due to the generator's extensive use of fixed tables. As a result, the website underwent a complete overhaul in 2000. All of the HTML was written from scratch using Notepad or similar simple text editors and this method is often still used today. Most of the graphics, including project schematics, are created with Microsoft Paint and other inexpensive image editors for optimum download times. The storage space on AOL, which was only a few megabytes in size, eventually was outgrown as the content expanded. A new domain name, Electronixandmore.com, was registered in August 2002 and the website has grown in content and popularity ever since. For ten years since the domain was first registered, the website has remained largely unchanged in terms of format and appearance. The content had grown so much since then that the website content became difficult to organize and maintain. In August 2012, the website went through another radical transformation as a step towards the 21st Century of website design. Many webpages were converted into PHP server side scripts that automatically generates the HTML for all the items in the various collections. Most of the collection content was moved into a single database file that is much easier to maintain. Some content had been thinned out as a step towards improving the quality and focus of the online exhibition. Adding new items to the collections are now painless because the collection listing, site map, and image thumbnail generation are all automated and handled by the PHP server side scripts. Jon wanted to learn PHP for so long and finally decided to put in the effort and learned something new. All PHP scripts were written from scratch. 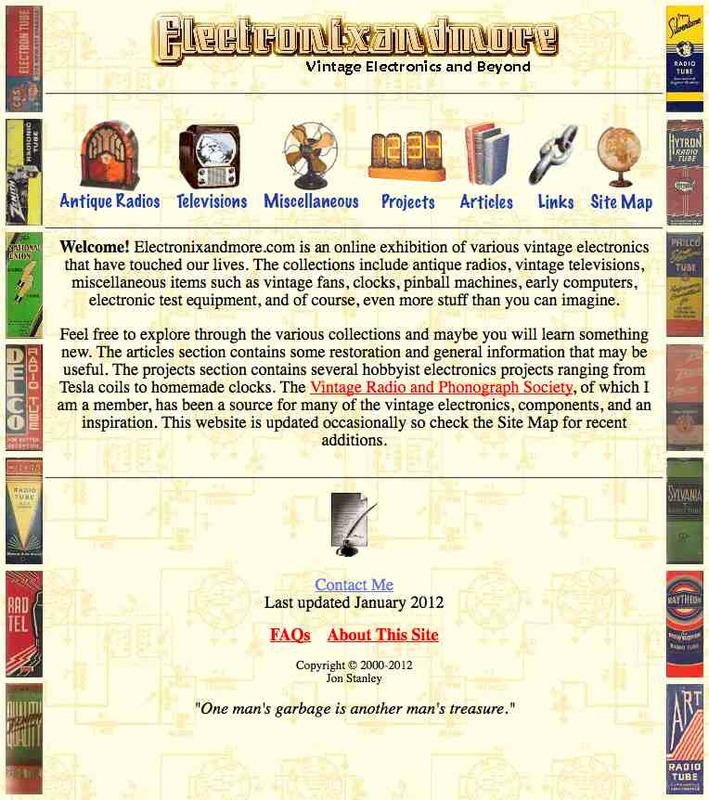 Above is the earliest recorded screenshot of the website. On a circa 1997 Packard Bell desktop computer with a 800x600 screen resolution, the website was created using AOL's (version 5.0) online "Easy Designer" website creator. The website began with the blue background, which lasted from late 1999 to 2001. The website went from the blue background to a lighter color without a background image in late 2001, shown below. The background image was added shortly after the background color switch as seen on the website shown below for ten years. The look and feel of the website from 2002 to 2012 before the makeover and switch from all HTML to mostly PHP scripts. The main page title image have changed over time and below are two of the longest lasting title images.